Above & below: Cemetery entrance, with the Stone of Remembrance immediately in front of us as we enter. We’ll check out the information boards in a minute. 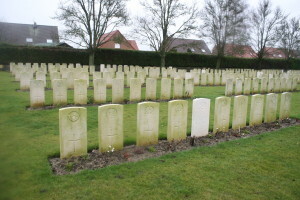 The cemetery consists of six long lines of headstones split into three plots with Plot II, the largest, nearest the camera, and Plots III & I on either side of the Cross in the background. 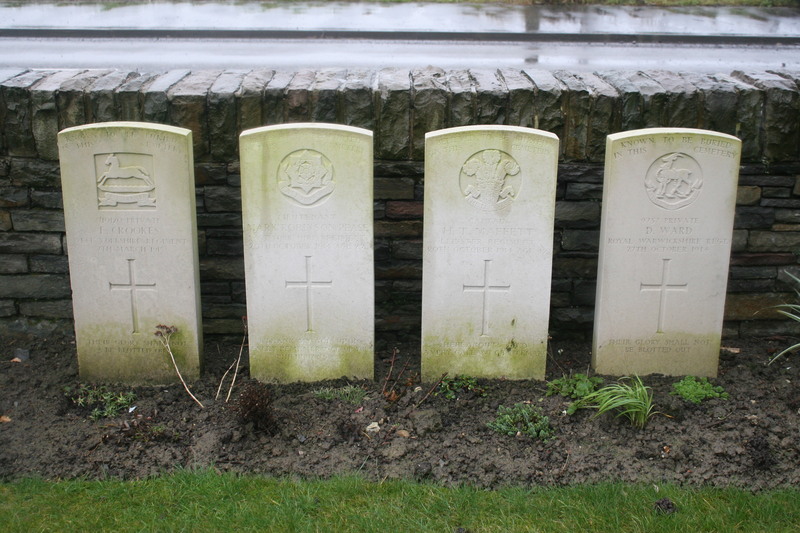 But before we explore, just inside the cemetery entrance there are four special memorial headstones where we should pay our respects, two privates flanking two officers, all ‘known’ or ‘believed’ to be buried among the 68 unidentified burials scattered throughout the cemetery. Handy CWGC information board. Worth enlarging, particularly as I can’t see much point in re-writing the information it contains. If for some reason you can’t read it, you will find the same text on the CWGC website. An interesting trench map, this one, from mid-June 1918, by which time British trench maps, which throughout the war had shown German trenches in red, and British trenches in blue, had about-faced, and German trenches were now marked in blue. Yes, these are German trenches, and for once the front lines, static for three and a half long years, have moved. The great German offensives of the spring and early summer of 1918 had seen breakthroughs along the front, not least here, and this trench map shows how extensive the German trench system had become in this captured area. 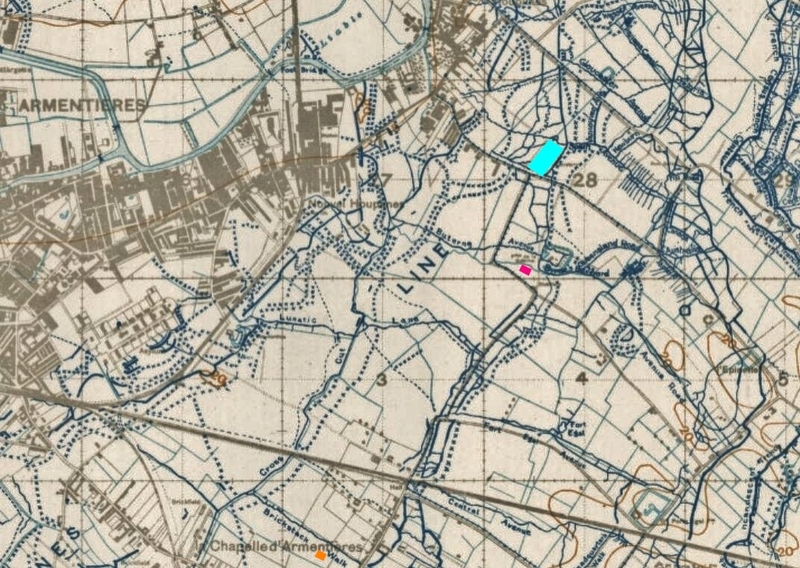 You can see that we are now a mile north of La Chapelle d’Armentières (the communal cemetery that we visited a couple of posts ago is marked in orange at the bottom of the map). 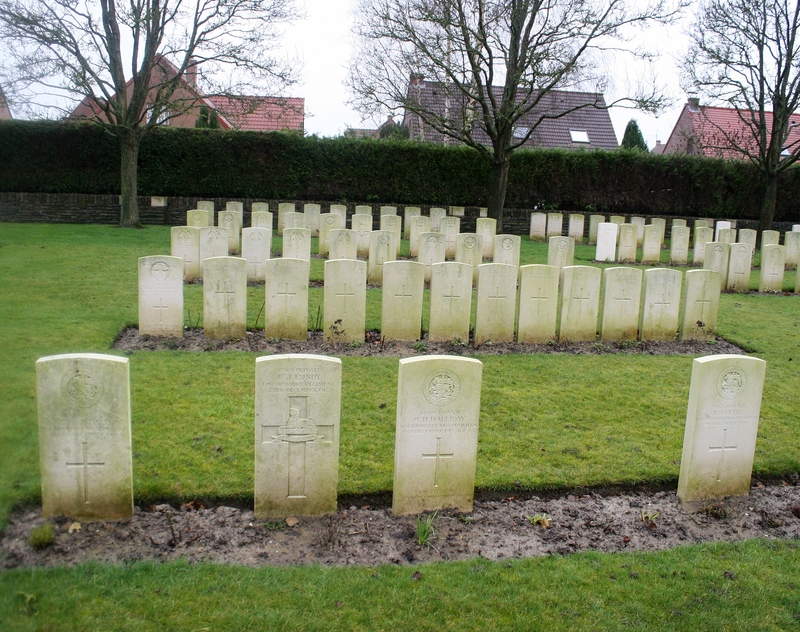 Ferme Buterne Military Cemetery is marked in pink and Houplines Communal Cemetery Extension in blue. Incidentally, if we were to continue north, across the river into Belgium, the next cemetery we would encounter, no more than three miles from here, would be Le Touquet Railway Crossing Cemetery, which you may remember we visited some time ago during our tour of the cemeteries south of Ploegsteert Wood. 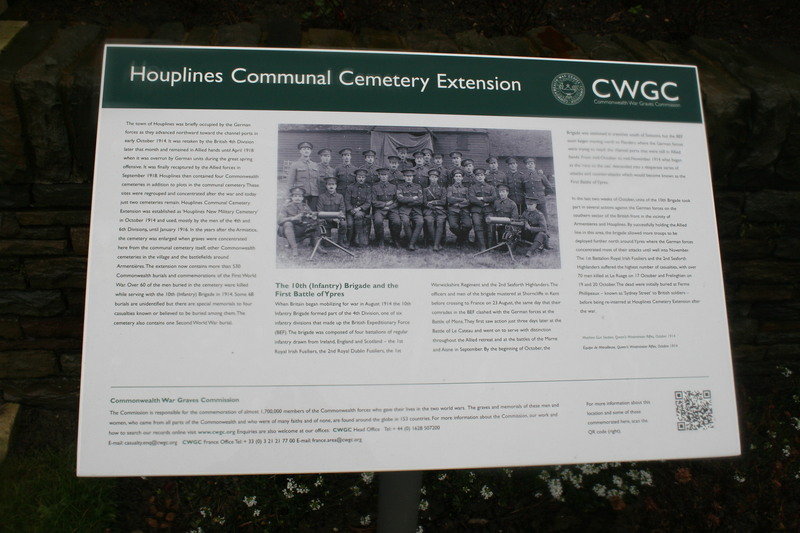 Although briefly captured by the Germans during the last days of the Race for the Sea in early October 1914, the village of Houplines found itself just behind the British lines from the beginning of trench warfare in late October 1914, until the German advance of April 1918. 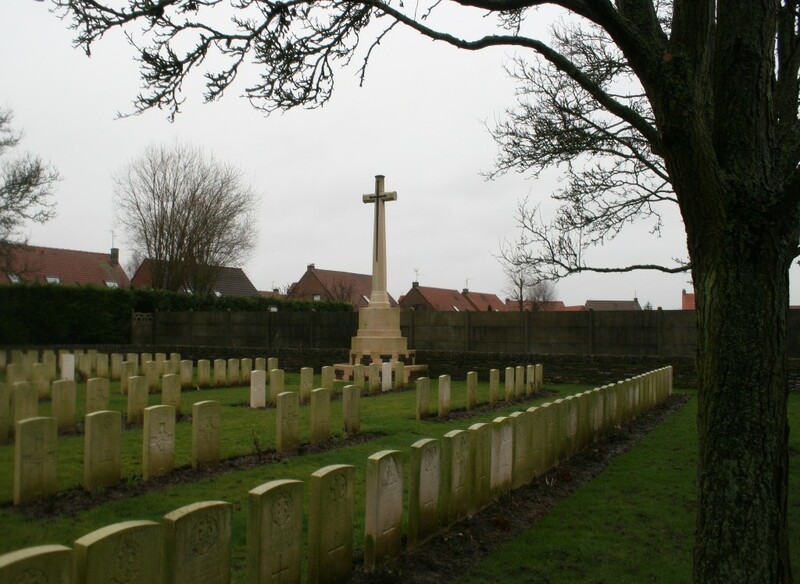 By the end of the war there were four British military cemeteries in Houplines, five if you include the burials that had already been made here next to the communal cemetery. Post-war it was decided to move the bodies from three of these cemeteries (the graves at Ferme Buterne Military Cemetery, as we have seen, were left undisturbed), to here. 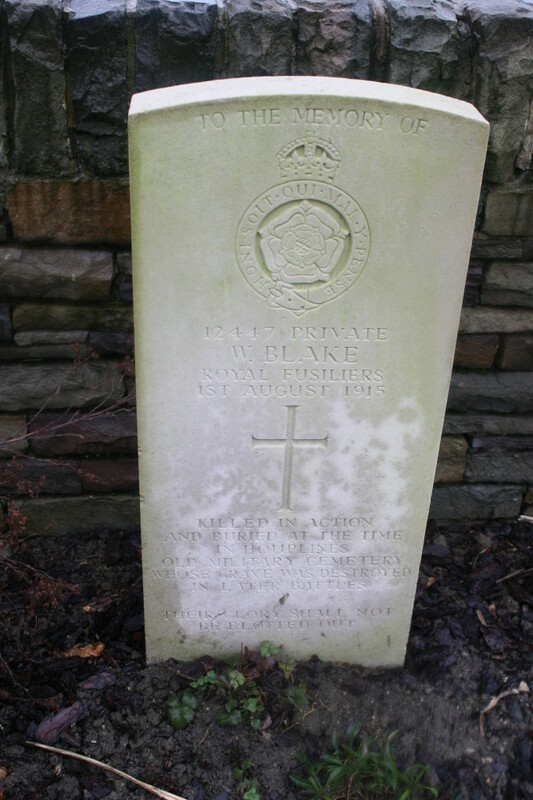 Plot II Row F, near the north west boundary wall. 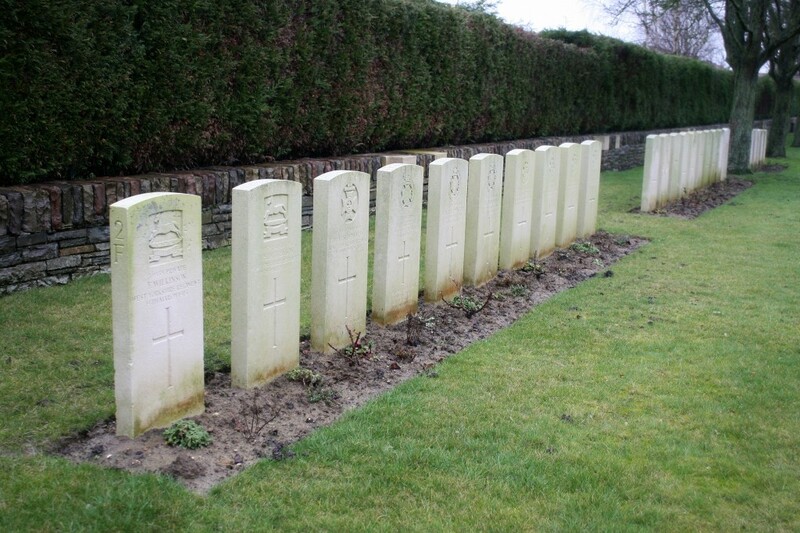 Note the grave of Rifleman Walter William Shephard of the King’s Royal Rifle Corps, three headstones from the left, just 17 when he was killed on 7th June 1915. 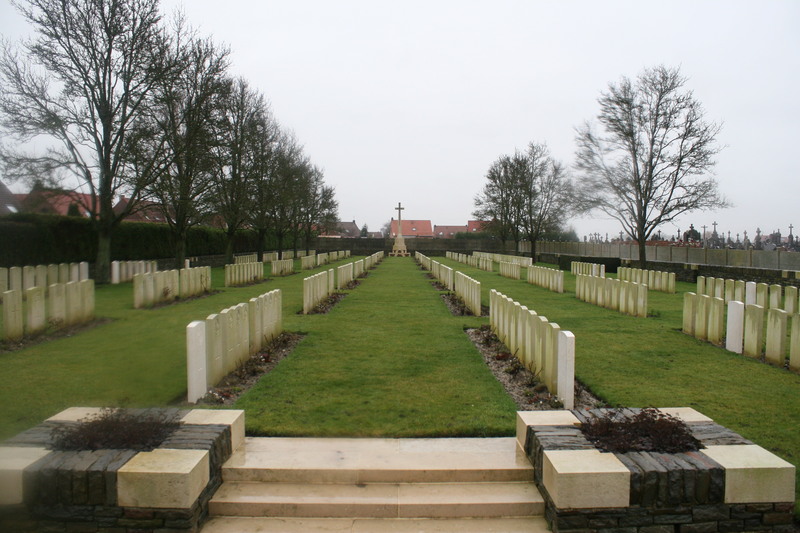 The cemetery, although large, is split into only three plots, as you can see if you take a peek at the cemetery plan, as ever courtesy of the CWGC. 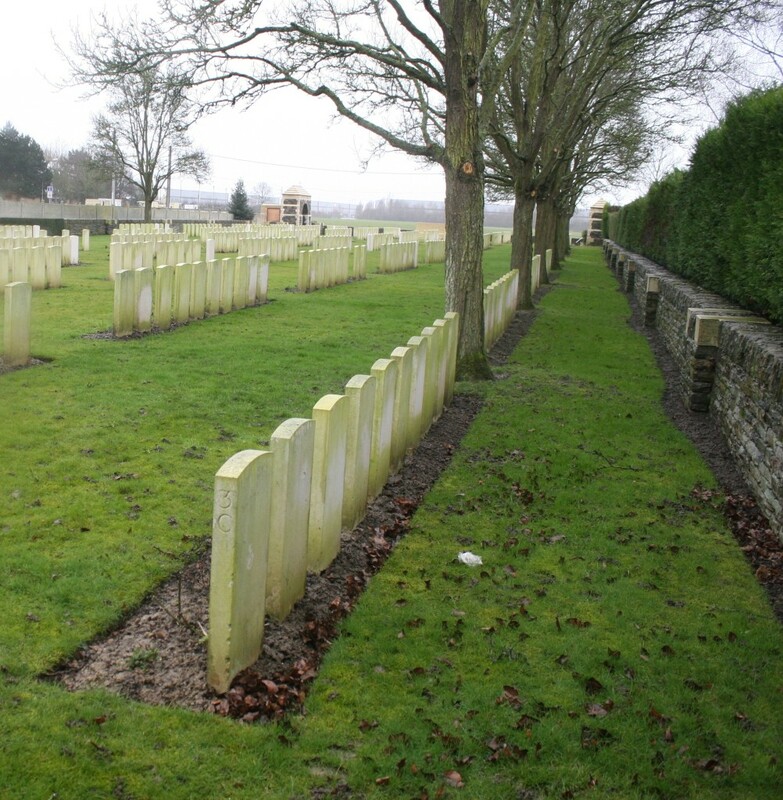 The cemetery’s only Second World War burial, Driver Enoch Farnsworth, 2 Corps Troops Ammunition Company, Royal Army Service Corps, killed during the retreat to Dunkirk on 23rd May 1940, is buried at the very far end of the row. Plot III. 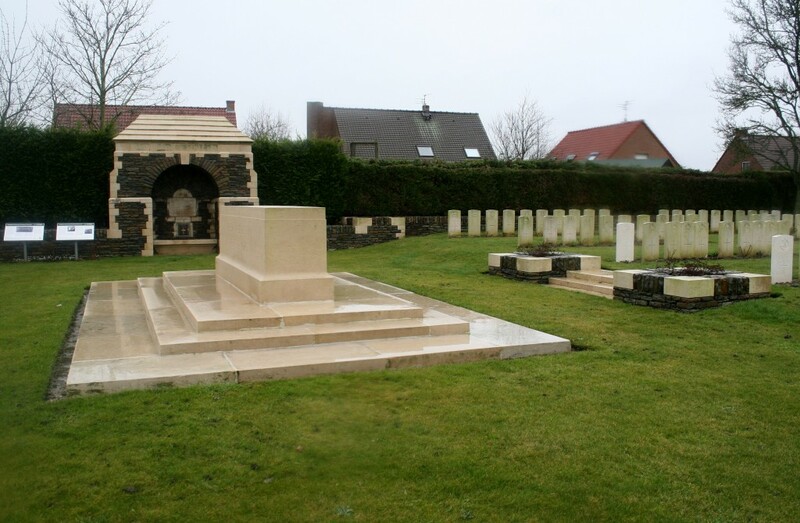 The cemetery, originally called Houplines New Military Cemetery, was opened in October 1914 and used until January 1916, and now contains 533 Great War burials and commemorations. Of these, 79 were made in 1914, and 362 in 1915. I suspect that both Plot II & Plot III (above, looking back towards the cemetery entrance in the distance) were made during the war, and that the graves brought here later are mainly now reburied in Plot I. 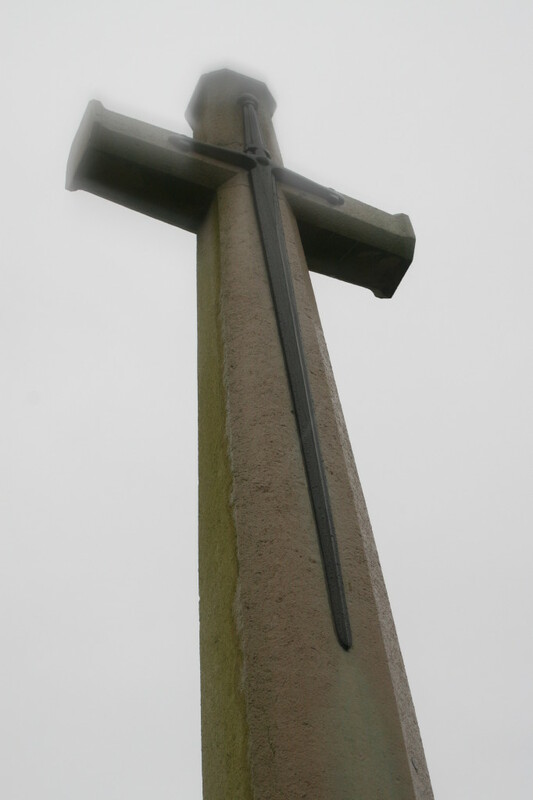 The Cross of Sacrifice, at the northern end of the cemetery. 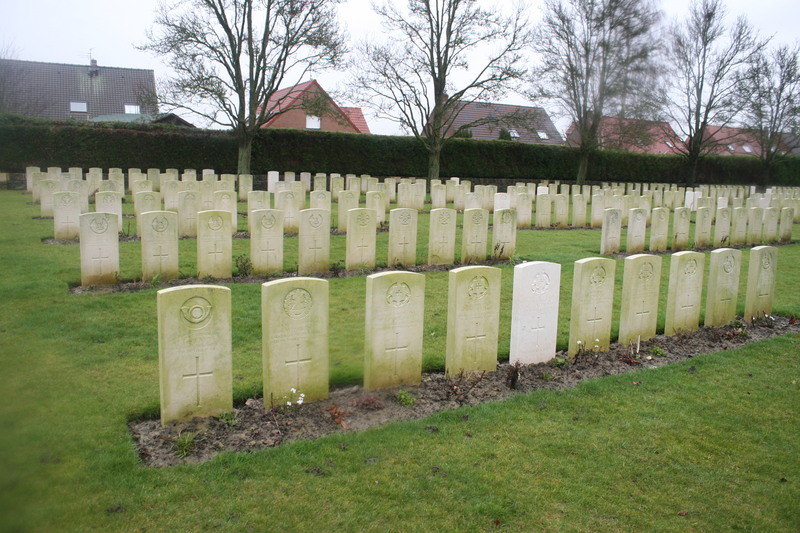 You will probably have noticed by now that quite a number of the headstones here, such as that of the unknown soldier at the far right of these unidentified men in Plot I Row C, and others in the rows behind, have been recently renovated. 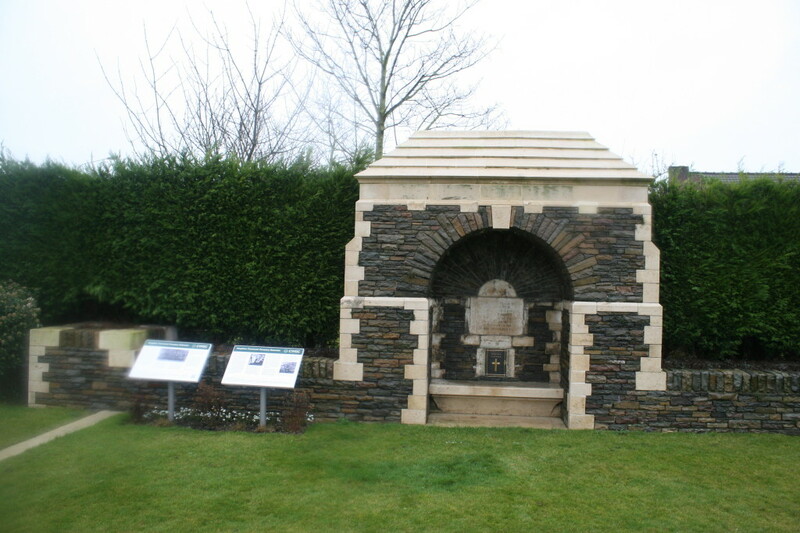 Although some replacement headstones are still manufactured using the traditional Portland stone, and of course local materials have been traditionally used where sensible, such as the slate headstones we sometimes encounter in the south west of England, other materials are also now used. The new headstones here are all made of Italian Botticino marble, which you see more and more these days. This view looks south west across the whole of Plot II. They certainly stand out! In recent years the CWGC’s factory in France has increased its output from some 6000 replacement headstones per year to well over 20,000! 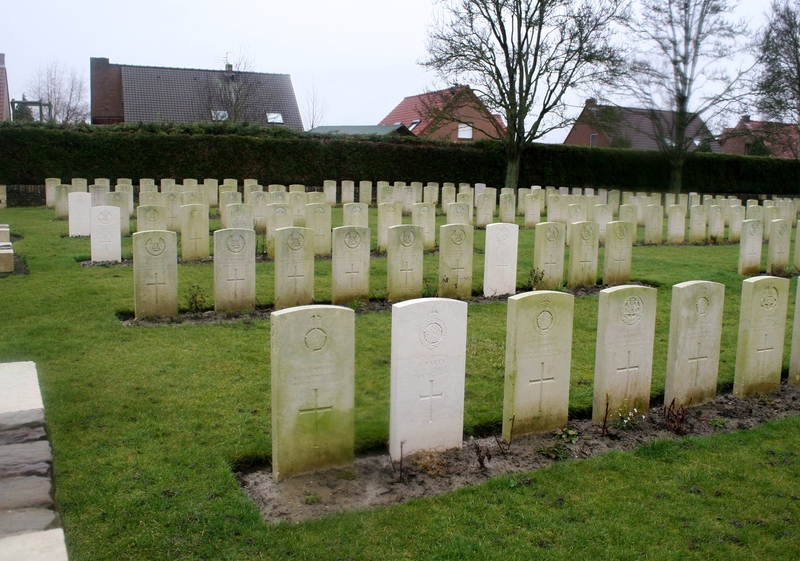 A couple of years ago it was estimated that some 70,000 headstones worldwide were in critical condition in that the names and inscriptions were becoming illegible. Plot I comprises the first three rows in this photograph; the three rows in the left background are Plot III. Plot I Row C again, with another of the new Botticino marble headstones nearest the camera. Plot I, Row A in the foreground. 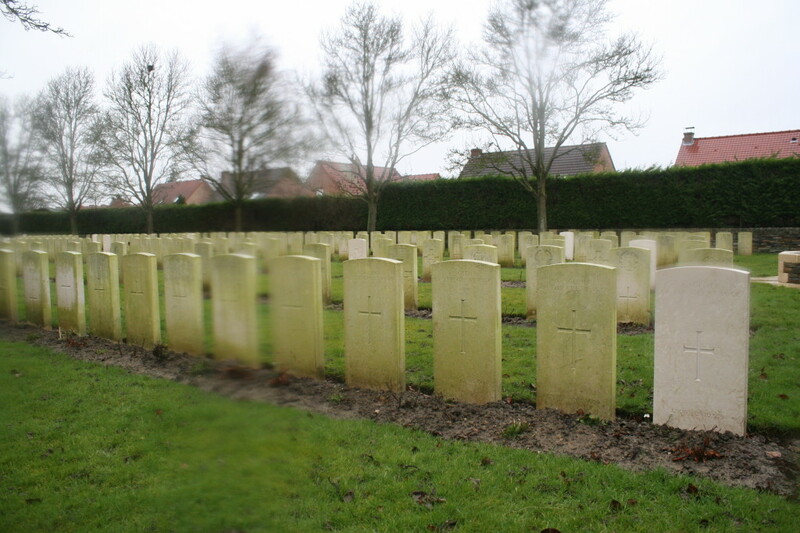 Note that all but one of the men at the start of Row B behind are unidentified; nearly all of the unidentified burials in the cemetery are to be found in Plot I, which is why I am certain it is the post-war plot, the graves brought here from other nearby cemeteries, as already mentioned. After three and a half years of static warfare, on 10th April 1918 the Germans opened an intense gas and high explosive bombardment which at last drove the British from their positions, the following day occupying Houplines and then Armentières itself. The city was finally recaptured by the British in early October 1918. 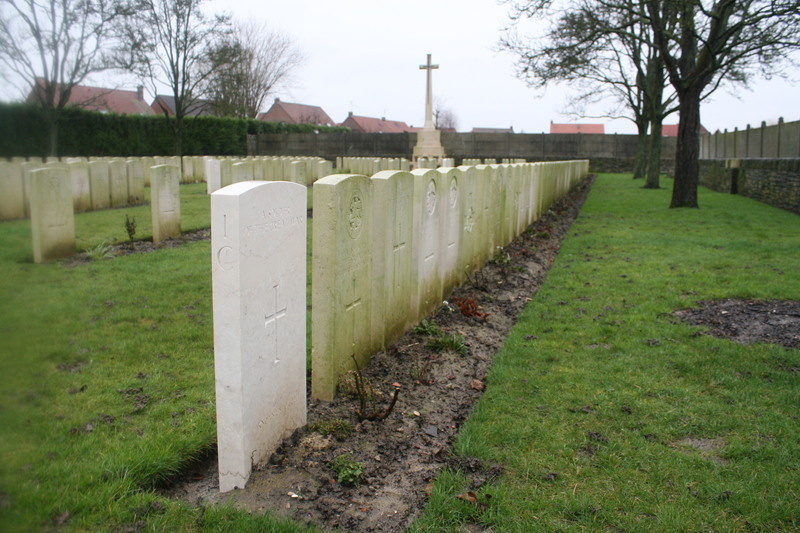 There are 16 graves here of men who died in October 1918 in the final few weeks of the war, the majority to be found in Plot II (above). Looking north from Plot II towards the Cross of Sacrifice. 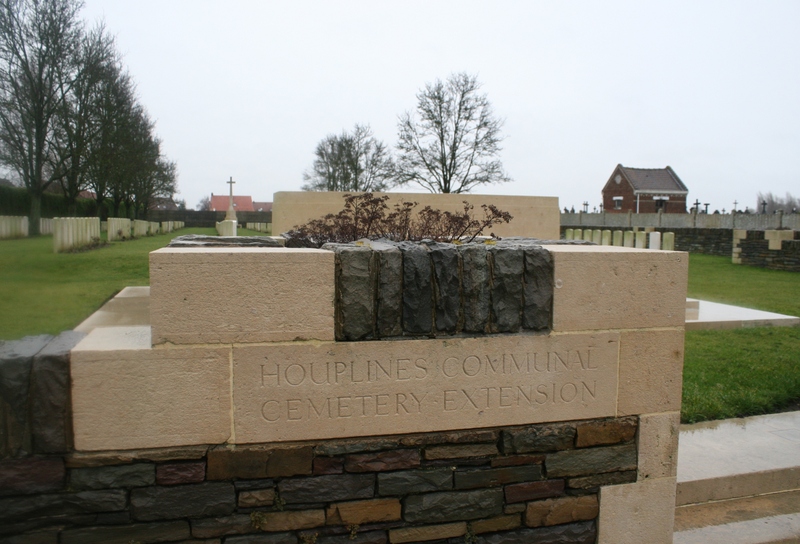 The Houplines sector of the front, like that across the Belgian border immediately north of the River Lys up to and beyond Ploegsteert Wood, saw many instances of the famous truce over Christmas 1914. 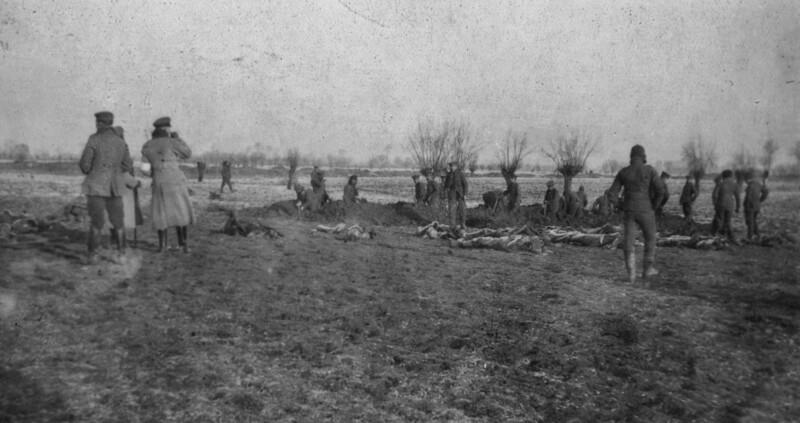 These two photographs, taken by an unknown officer of the Queen’s (Royal West Surrey) Regiment near Houplines, and reproduced here by kind permission of the Surrey History Centre, show British and Germans meeting in No Man’s Land on 19th December 1914 to bury the dead of both sides. 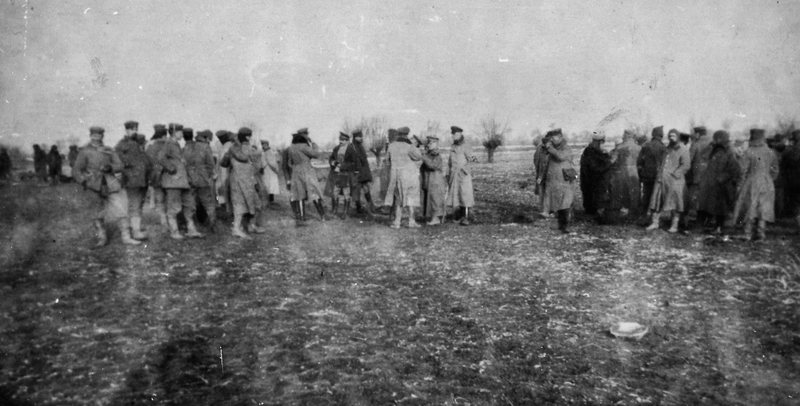 Assuming that the date is correct, and I have no evidence to suggest otherwise, these pictures are surely among the earliest examples of the truce that exist. 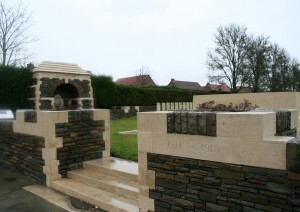 Note the ‘trench’, clearly built above ground in the background, a good example of the high water table and of the difficulty in digging in these areas of Flanders. Both photos enlarge considerably – the detail is fascinating, and terrible. 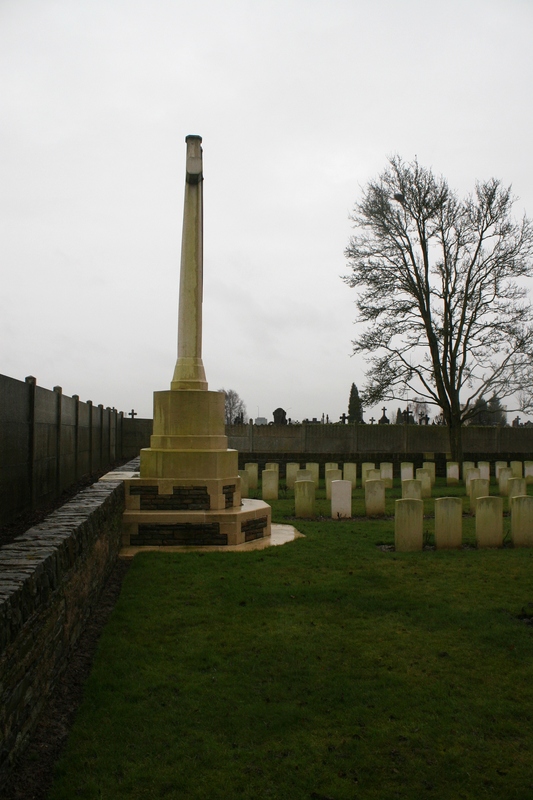 For some reason the CWGC website tells us that there are only four special memorials in this cemetery, but the original documents available on the site, and the cemetery plan, clearly show that this is a fifth. Which brings us to the end of a long, tour. A long, wet, tour. Hopefully we have shed a little light on a relatively unknown sector of the Western Front, where there were no pitched battles for over three long years, and where the front lines hardly moved at all during that time. 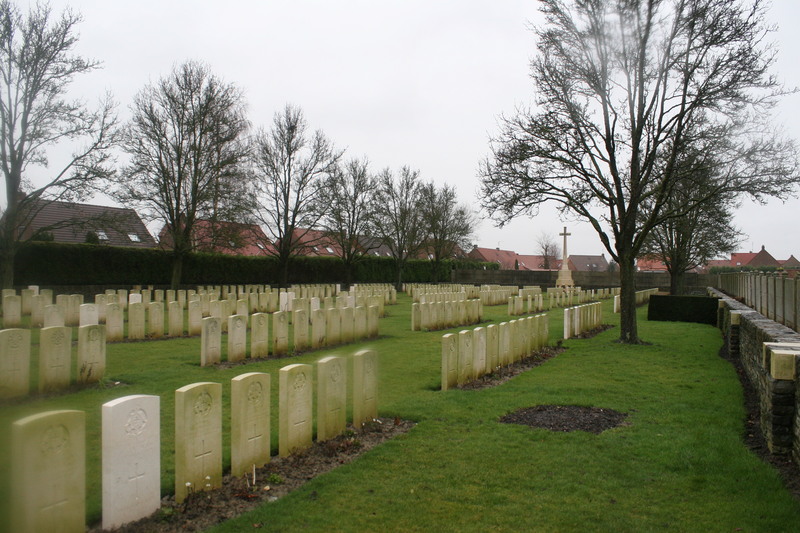 The twelve cemeteries we have visited on this tour are those closest to the front lines along the short length of front we have travelled. 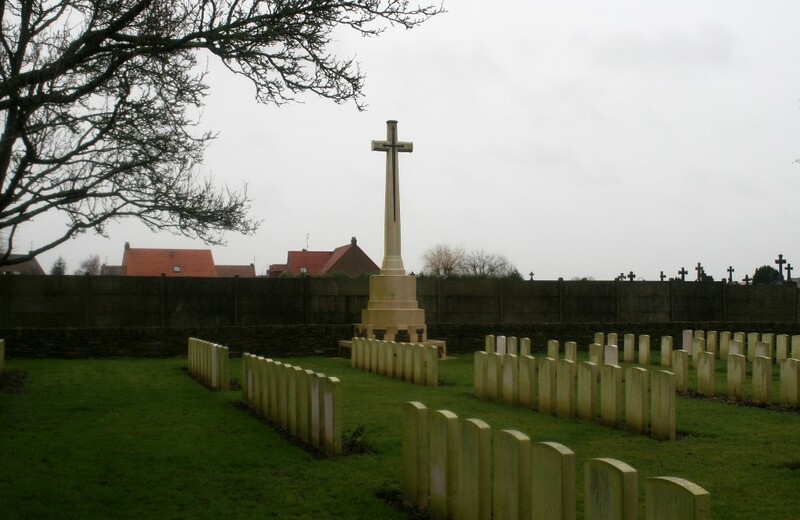 But there are more cemeteries a little further behind the British lines, and others to the west of Armentières that tell tales of the early days of fighting before trench warfare took its grip, that we shall visit in due course. 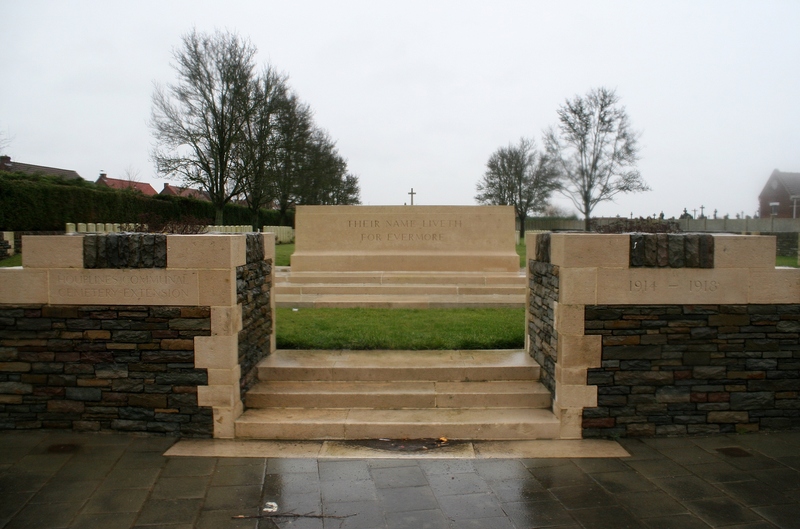 For now, however, we say au revoir to French Flanders, and turn our attention back to Ypres. 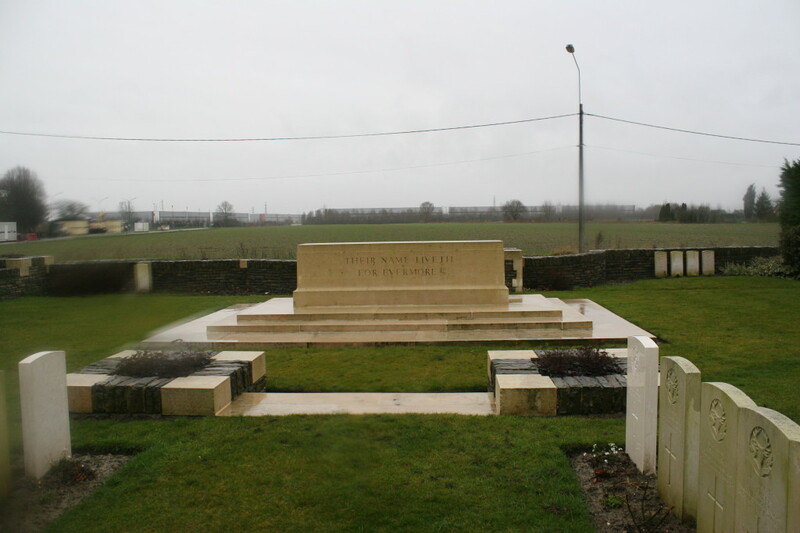 Or maybe the Somme. Thanks Morag. Y’know, on all my travels, I have never visited Talbot House. Nor Poperinge, come to that. One day. Glad you enjoyed the read. So I have heard. One day, Morag. Hello Joyce. A couple of pictures before the two black & white photos there are two small photos side-by-side. Click on the left one. 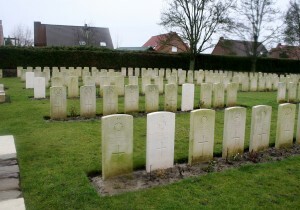 Your Great Uncle is buried in the second row, which is Row B, furthest headstone to the right, which is No. 10. Hope that helps, and glad you found my site of interest.